363 days have gone by for Noah. He had just sent the dove out for the third time and was waiting for it to return with yet another olive leaf in it’s beak. He waits 7 more days, gives up on the dove returning, and decides the end of his stay in the ark has come. 370 days after the Lord closes he and his family inside the safety raft, Noah removes the top cover and see’s the earth has dried. 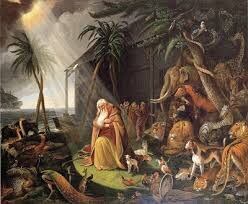 God remembers Noah and speaks to his faithful servant. He tells him it is time to leave his ark and enter the new world. As Noah and his family walk from their ark, the scene seems like it would have been serene. The knowledge that the entire human and animal race has been destroyed would have been heavy and solemn. He and his family would be the new beginnings of a people led and loved by God. The promise of the gospel is that the cross of Christ will bring us safely to the new world. The time spent in the ark would have been turbulent, trying, and incredibly hard. They would have been worn out by caring for themselves and the myriads of animals floating on their barge. But the work was not in vain. They reached their destination where righteousness might reign on earth for a time. The time would not last long, but it is a picture of a time where righteousness will reign for eternity at the last day. Remaining in Christ in this world is much like being in an ark. The work is hard, but the benefits are eternal.